I do not like making objects with my hands. But I lived in Soviet Russia. So I knew how to crochet, knit, and sew — because in Russia at that time, we didn’t have a choice. I was always bad at it. The only thing I was good at was darning socks: I had to do it too often. By the way, I failed to find a video on how to darn socks the same way my mom taught me. Then I came to the US. I suddenly found myself in a rich society, where it was cheaper to buy new stuff than to spend the time doing things with my hands. So I happily dropped my craftsmanship. After not working with my hands for 28 years, one day I needed hyperbolic surfaces for my classes and I couldn’t find any to buy. Hyperbolic surfaces are famous for providing an example when the Euclid’s Fifth axiom doesn’t work. These hyperbolic surfaces look flat locally, so you can continue a line in any given direction. If you draw a line on such a surface and pick a point that is not on the line, then you can draw many lines through the point that are parallel to the given line. My students are more important than my dislike of crochet, so I decided to just do it myself. I asked my friend Debbie, who knows how to crochet, for advice, and she gave me more than advice. She gave me a hook and a piece of yarn and reminded me how to work the hook. She started me with a small circle. After that all I had to do was add two stitches for each stitch on the perimeter of the circle. 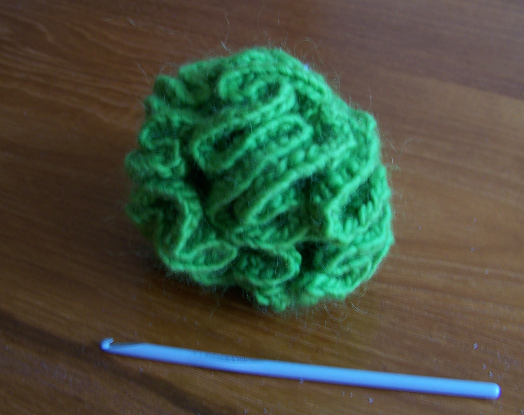 The finished product is this green ballish thing that looks like a brain, as in the photo. Outside the starting circle, each small surface segment of this “brain” looks the same, making the “brain” a surface of constant curvature. I chose a ratio of 2 to 1, adding two new stitches for each previous stitch. With this ratio, my flattish surface started looking like a ball very fast. The length of the perimeter doubled for every row. Thus each new row I crocheted took the same total amount of time that I had already spent on the whole thing. All the hours I worked on this “brain,” I kept thinking: darn, it is so unrewarding to do this. Annoying as it was, the thing that kept me going was my initial decision to continue to use up all the yarn Debbie had given me. In the end, with this ratio, half the time I worked was spent making the final row. Ι think a horse saddle is a good approximation of a hyperbolic surface. The sum of angles in a triangle drawn on this surface would be smaller than 2π ,and parallel lines would not be equidistant,but would diverge gradually from each other .